For seven decades Marie Assaad tackled Egypt’s controversial social issues with gentle grit and unwavering resolve. A pioneer in the social development field, Assaad gave impetus to combating the prevalent practice in Egypt of female circumcision, also known as Female Genital Mutilation (FGM). 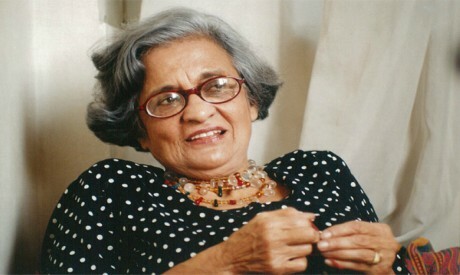 Her initiative in the mid-1990s garnered community organisations, NGOs, the media and the government itself. The persistent campaign brought to national attention a topic that had hitherto been taboo. The campaign was born out of Egyptian civil society’s preparation for the UN’s International Conference for Population and Development (ICPD) held in Cairo in 1994. A taskforce headed by Asaad to combat FGM was formed. In 2008, the Egyptian government issued a law criminalising FGM, with the first case tried in 2015. Her versatile stints in communal service were characterised by her ability to initiate grassroots action and bring in a broad spectrum of partners in what she called her “community of love”. She held key positions in both Egyptian and international chapters of the Young Women’s Christian Association (YWCA) and was the first woman and non-clerical figure to become deputy secretary-general of the Geneva-based World Council of Churches in 1980. During her six-year tenure with the World Council of Churches, Assaad placed women’s issues on the council’s agenda, and presented a study on women and sexuality in the different religious traditions. She played a central role in establishing, as well as formulating, a vision for the Moqattam-based Association for the Protection of the Environment (APE). A landmark experiment in Egyptian social development, APE follows a comprehensive approach, empowering the zabbaleen (garbage collectors) community through education, entrepreneurial projects and instilling awareness of the importance of a sound environment. Born Marie Bassili on 16 October 1922 in the Cairene district of Faggala, Assaad’s voluntary social work started early. As a schoolgirl at the Cairo American College for Girls, she volunteered to tend to disadvantaged families suffering tuberculosis, and giving literacy instruction to their children. She became active with the Egyptian branch of the YWCA as “junior leader”, and held a 16-month stint with the World YWCA in Geneva in the early 1950s. She became secretary-general of the Egyptian YWCA, which became more closely consolidated with the World YWCA, but resigned when she married in 1954, though continuing to volunteer for the organisation. In 1965, Assaad joined the American University in Cairo’s Social Research Center, focusing her anthropological research on population studies. In 1970, she published her seminal study on FGM in Egypt and Africa, the first of its kind to cover such a wide-scale range as well as shed light on the social and cultural factors perpetuating female circumcision. It became the basis of work for the committee preparing for the 1994 ICPD Conference. During the campaign against FGM, Assaad typically opened up boundaries, bringing both Muslim and Christian clerics to the table. Despite her autonomy and refusal to take on formal positions, she did not hesitate to solicit the support of the government. Combating FGM consequently took centre-place in the agenda of the government-affiliated Council for Motherhood and Childhood. Born an Orthodox Copt, Assaad was a deeply spiritual woman who played a role in establishing The Coptic Church’s Bishopric for Social and Ecumenical Services. Her concept of service was faith-based, laced with a warmth emanating from her ability to reach out and with empathy to accept diverse strains of thought. She called the friends and working partners whom she garnered and cherished over the years her “social capital”: a community of love, given and reciprocated. At the funerary service which was held on Sunday, family and friends of all ages attended. Bishop Moussa, bishop of youth at the Coptic Orthodox Church spoke of Assaad as an “icon of love”, touching upon her diverse roles as a mentor in public life, within the Church, and through the deep personal bonds she forged with people of all denominations. “She transcended the boundaries of rich and poor, educated and ignorant, Christian and Muslim,” Moussa said. Assaad is survived by her three sons Adel, Hani and Ragui, grandchildren and great grandchildren, and the countless people whose lives, like this writer, she touched with her legacy of love.